Over the past ten years Fredrik Bock has worked as lutenist and guitarist while based in Copenhagen and Malmö. 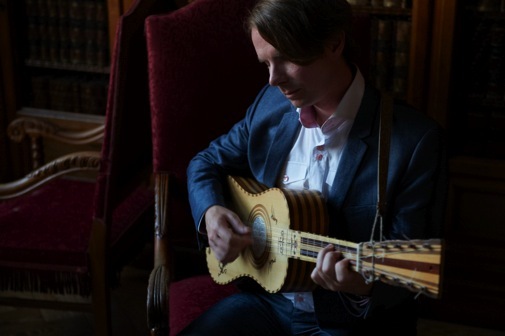 Taking his inspiration from the music of the Renaissance and Baroque, Fredrik plays a number of the many instruments of the guitar and lute family, both as soloist and together with established soloists, ensembles and orchestras. Fredrik´s natural curiosity and interest in other genres often lead to musical encounters off the beaten track: one day at a folk song festival, the next with pub musicians, and now and then contemporary classical music. Fredrik performs regularly with some of Europes´s leading ensembles and orchestras, including Barokksolistene, Concerto Copenhagen, Elisabeth Holmertz, Theatre of Voices, Atalante, Poul Høxbro and The Finnish Baroque Orchestra. Fredrik is one of few lutenists to become a specialist on Baroque guitar, and his uncompromising pursuit of artistic excellence has garnered him a number of grants and prizes. He has moreover contributed to a good many radio and television recordings, and CD and DVD productions. Fredrik first solo recording ”Music for a Queen” with music by Michelangelo Bartolotti will be released on Lawo Classics 2013.